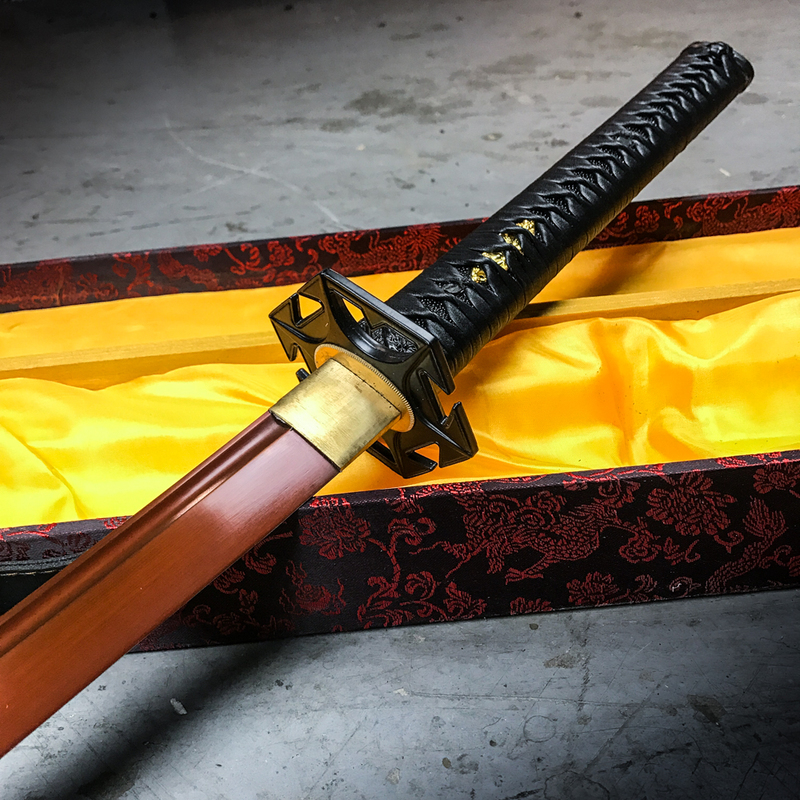 Hand Forged Masahiro Samurai Sword Anodized Copper Finish With Scabbard | BUDK.com - Knives & Swords At The Lowest Prices! 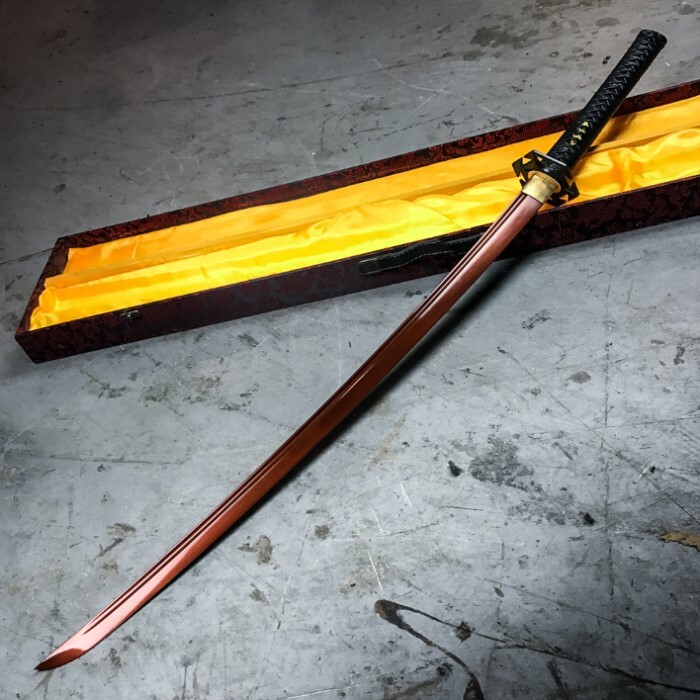 This top-quality Masahiro Samurai Sword measures in at a whopping 41 inches from end to end, featuring a 28" hand-forged 1060 carbon steel blade with a sharp edge and a unique, anodized copper finish. A heavy blood groove adds authenticity to this stunning blade with 10-fold layers. It has the look and feel of a rich copper-tone Damascus blade. 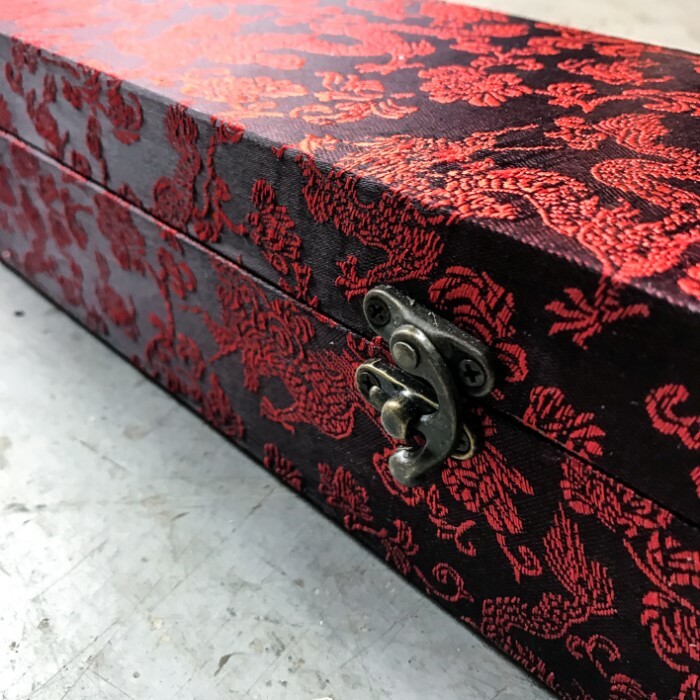 The handle features genuine ray skin and a decorative cord wrap and cast metal alloy embellishments including a custom-designed habaki, tsuba, menuki and pommel. 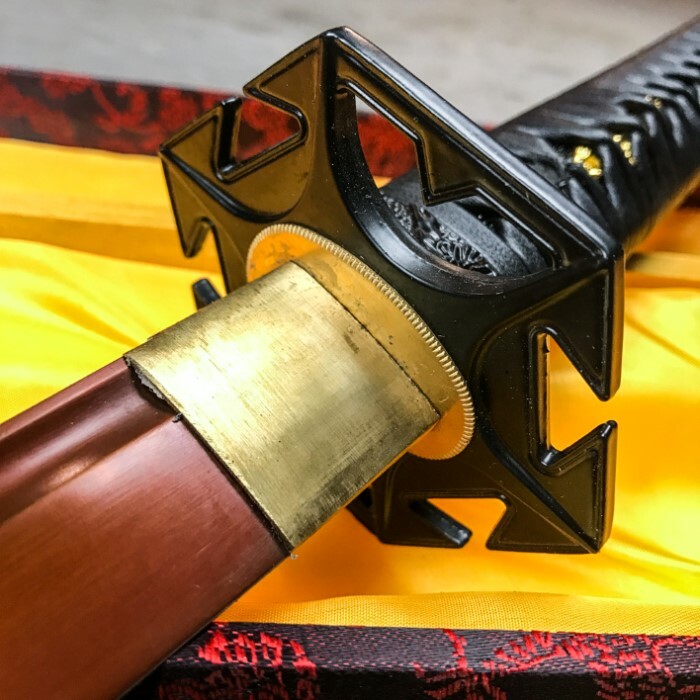 A hand-lacquered scabbard houses the blade. "Masahiro" It clearly says ten ryu on the tag attached to the hilt and the box. "this finish is forever fixed to the blade" more like copper rustoleum. My blade was un-oiled and one gentle swipe of paper towel rubbed off the copper coating. switched to toilet paper to oil it. Still dragged enough reddish black stuff to reveal that the coating is just a cut away from disappearing. However, swift and good package arrival and protection and the inscription was correct. Well this sword definitely exceeded all expectations I set up for it! The blade is an amazing color, the edge is almost razor sharp, and it's wrapping is near flawless. I'm not sure why other reviewers are having an issue with the pegs though, I'm able to disassemble the blade effortlessly. All in all, definitely a purchase I recommend! I ordered this right before new year's. An all around great sword. The coating on the blade look more cooper than the blood red color I was expecting, but still very cool. Probably isn't going to be my first choice of blades to use, but that is mostly because I want to save the blade color. Although I have to pick apart a few of other people's reviews. To those complaining about the color being permanent, it is much like the paint on a car. The paint is charged to stick to the metal of the car. The paint doesn't simply fall of a car, and it doesn't here either. However, if you grind away the steel, then you are exposing steel that hasn't been treated with the coating. And the people complaining abut "crooked" pegs, just calm down. Most swords have angled pegs. This gives the sword a stronger structure. I've never owned or seen a sword with pegs that are perpendicular to the hilt. I have no trouble removing the pegs, although I still haven't been able to remove the blade, but it isn't because of the pegs being stuck. Since I am the first reviwer. AND I am NO sword expert nor claimn to be. I had high hope this sword would be the red gem in my collectio. However, I have to leave it in the scarrab because of several nic's on the edge and scraps on the sides of the blade. The scarrab and the wrapping are AWESOME but the most important part (the blade) is the worst part. Maybe this is the only one that is like this, but i got it. Now, I have bought many items from Budk and have been happy with most of those items, and probably will continue to buy from Budk, but when it comes to show pieces i will spend the extra $50-100 on a web site that sell's real show pieces. The old saying You get what you paid for comes to mind. The sword seems like it might do work more than show. the copper color comes right off with simple cuts (card board). OH well, I will keep looking. Got my sword in the mail, fast delivery. Unwrapped it for christmas, was excited for a long lasting friendship. Upon maintenance the pins were aligned crooked and will not get out no matter how hard I try to get them out. This is disappointing because I was expecting a quality sword to own for a lifetime instead of one I can't disassemble. Besides that it was nice and oiled upon getting it out of the box. Although not razor sharp, can cut through water bottles, and is great for stand-alone practice. 2/5, Next time the sword maker should check to see if the sword is quality. I just had a whirl with my sword and am at the moment satisfied, however I am having trouble getting the pegs out and they seem to be in really tight and seemingly crooked. I bought this sword a few years back, and while it has held up well enough, one thing to this day that annoys me is that its tip came with this wierd poorly defined edge. To this day even with years of regular sharpening, the thick dull edge of the tip is to wide to get sharp. Its lack of even sharpness the full length of the blade and the odd deformity eventually had me take it apart and just leave the blade in its sheath to show as an oddity now and then. 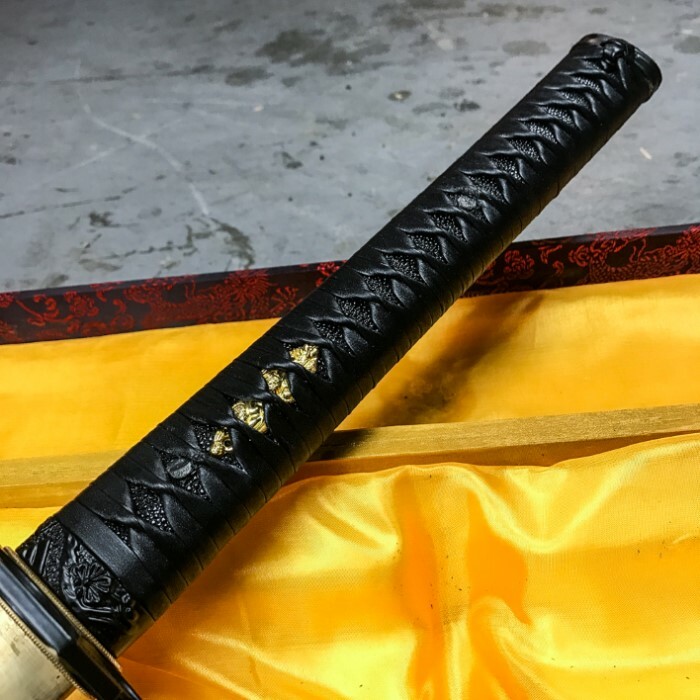 Ive never bought another blade from this forge, though swords bought at true swords of the musashi/musha brand often at a lower price point have proved so reliable Ive bought several over the years to give as gifts to those starting to collect or practice cutting. this literally became my favorite blade that i currently own. 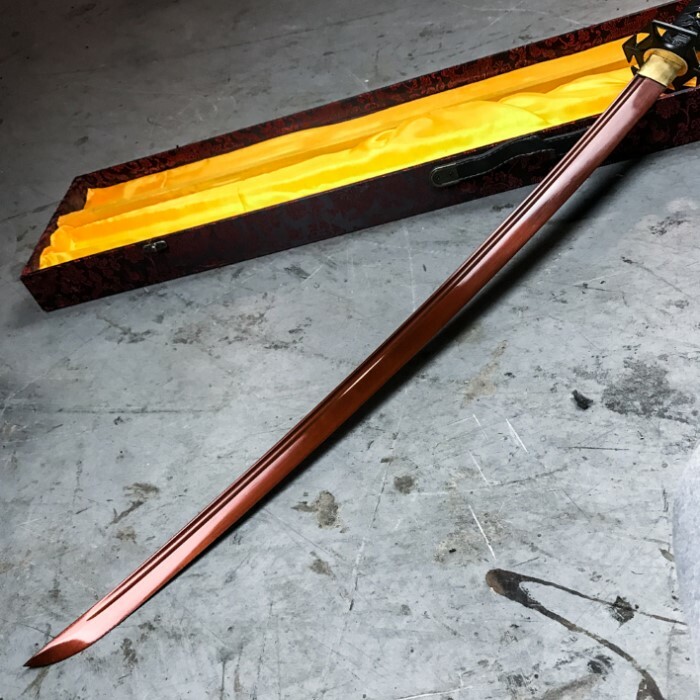 anyone thats looking for a sword with that perfect feel to it, i strongly recommend this sword. it looks fantastic it feels fantastic, i give 5 out of 5.. Perfect i absolutely love this sword came exactly like picture but to be honest it still doesn't do it justice the beauty of this sword is astonishing had me breathless when i opened the box had quiet a bit of oil on it as expected but I'm not complaining rather have that then see rust if i could give it more stars i would and I've read some of the other reviews saying it had China on the blade i inspected it thoroughly and found no such thing with the buy never seen another katana like this MUST BUY for any collector. The information is wrong about the anodized color staying forever. I stuck the sword into the ground and now the tip is silver. We make the best effort possible to ensure all product listings are correct and not misleading as suggested above. Should you ever receive an item which is different than described, or have any concerns whatsoever, please contact us and we will act quickly. This sword comes as advertised. In speaking with our customer we found that their main concern was the edge appearing silver after they used a sharpener on the blade. The reddish copper color blade finish has been permanently fixed to the steel using an electronic process, not a paint job or baked on finish. The finish does not rub off, however if you remove the steel which holds the finish then you would expose the steel underneath. Such steel removal could take place by using a sharpener which by design removes steel to hone the edge, and the newly exposed steel would have the normal steel color. We have made every option available to our customer multiple times, including that of a full refund. Our customer expressed being happy with the sword and having no interest in returning the sword.